From left are: Oswego Police Chief Tory L. DeCaire, Oswego County District Attorney Gregory S. Oakes, Oswego Mayor Billy Barlow, Oswego Police DARE Officer Thomas Grover, and Oswego Police Sergeant James Cunningham. OSWEGO – Mayor Billy Barlow. 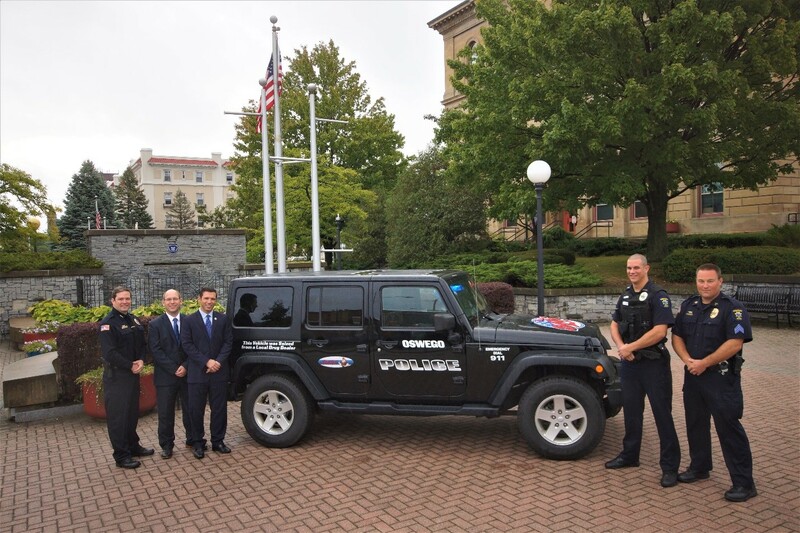 is proud to announce that the Oswego City Police Department has designated a “DARE Car” for use by the department in delivering the DARE curriculum to schools in and around the city of Oswego. 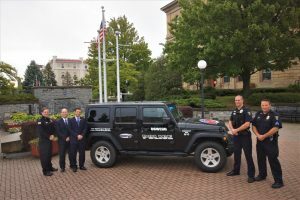 The vehicle, a 2014 Jeep Wrangler, was forfeited to the Oswego City Police Department through the Oswego County District Attorney’s Office as the result of a guilty conviction stemming from a recent illegal drug case. The forfeited DARE vehicle was outfitted with emergency lights and official police markings utilizing asset forfeiture funds from other unrelated criminal case seizures. This is the second full year that the Oswego City Police Department has been delivering the DARE curriculum in the area schools and the program has been met with a lot of excitement and enthusiasm by city officials, school administrators, police and students. In addition to the educational aspect, the Oswego City Police Department; continues to be an active partner with the Oswego County Drug Task Force, is a cooperating agency in the city of Oswego’s REAP (Rapid Evaluation for Appropriate Placement) Program, provides the community with the drug detecting Police K-9 Crixus, and is home to Prescription Medication and Sharps Disposal kiosks that are located in the lobby of the police department with 24/7/365 access. For more information on any of the programs listed, or to learn how to get involved in one of these programs, please contact the Oswego City Police Department’s Criminal Investigations Division Commander, Lt. Zachary Misztal email: [email protected]<mailto:[email protected] or phone: 315-342-8124).